Ethereum price topped near the $188 level and declined recently against the US Dollar. 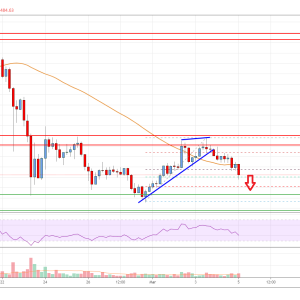 ETH broke the $176 and $169 support levels to move into a short term bearish zone. There is a major bearish trend line formed with resistance at $169 on the 4-hours chart (data feed from Coinbase). The price could decline further...The post Ethereum Price Analysis: Another Bear Wave Before Higher? appeared first on Live Bitcoin News.